Ned Zeman had it all. A lucrative career as writer and editor at Vanity Fair, great friends and what would appear to be a great life. But he suffered from depression and anxiety and it took over his life. In The Rules of the Tunnel: My Brief Period of Madness, Zeman takes us into his mind, letting us glimpse what it might be like to suffer as he has. As a writer and editor, I found interest in Zeman's descriptions of his work, the processes and relationships between writers and editors. He tells detailed stories of people he researched and wrote about who were fascinating adventurers who seemed to also suffer from depression. These stories were quite interesting and offered more examples of what it's like to deal with depression. But I found the stream-of-consciousness style of writing and the author's use of the second person very difficult to read. I realize he employed these tactics for literary and artistic reasons. Logically, they make sense. After all, if you have amnesia, it's hard to speak in the first person about things you don't remember. But my brain doesn't process this rambling type of prose well. I had a hard time following along and feeling engaged in his story. I found myself reading several pages and realizing I didn't know what just happened. It jumped around a lot and I just couldn't focus on what I was reading. Ned Zeman's overall story of trying various therapists and medications, and eventually getting shock therapy, which caused amnesia, was fascinating. And I'm sure many readers would get much more out of it than I did ~ as is evidenced by several great reviews from the bloggers listed below. For me, it was just okay. 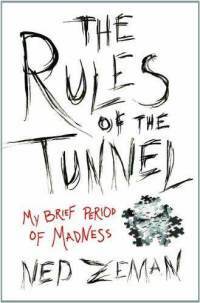 The publisher has graciously offered a copy of The Rules of the Tunnel by Ned Zeman as a giveaway for one of my readers. To enter, just leave a comment below with your email address. You can get additional entries for following My Book Retreat, following me on Twitter (@MyBookRetreat) and liking My Book Retreat on Facebook. Just leave a separate comment for each. The giveaway ends at 10:00pm EDT on September 5, 2011. This giveaway is open to US and Canada addresses only. This review was written based on a copy of Rules of the Tunnel that I received from TLC Book Tours in exchange for an honest review. This sounds really interesting! I worked at a Behavioral Health Center after college and, while they no longer did things like Electroshock Therapy, I heard plenty of horror stories! Thanks for the giveaway! I have suffered from anxiety disorders my whole life, so I think I could relate to this book a lot and probably learn a lot as well. I'm sorry the format didn't work for you but thanks for sharing your thoughts for the tour! I think I also had trouble with the 2nd person writing style, but I sort of just fished around it to get to the bottom of this story. It was rather jarring, and I had to really work to understand what he was trying to impart sometimes. Not the best choice for a memoir, I think. I do find it very interesting that you speculate as to why he wrote it in this fashion, and I think I agree with you. Great review on this one. You gave me a lot to think about.